Perfect to fill jam tarts or great just on bread. Put a couple of saucers in the freezer. Cut the apricots in half, remove the stones and tip the flesh into a large, non-reactive stainless steel saucepan with 200ml water and the lemon juice. Crack 6 or 7 apricot stones with a rolling pin and prise out the white kernels inside; add them to the pan. Bring the pan to a boil over a high heat, then reduce to a simmer; cook for 20 minutes, until the apricots have broken down to a pulp. Add both sugars and stir over a low heat. Once it looks like all the sugar has dissolved, turn the heat right up and boil for about 15 minutes, until the bubbles rising to the top of the pan start to look quite large and a sugar thermometer reaches 105c. If you don’t have a thermometer, check that the jam has reached setting point by putting 1 tsp onto one of the chilled saucers. Return to the freezer for 30 seconds – at this point, it should have formed a skin that wrinkles when prodded. If not, let the jam bubble for a couple more minutes before testing again. 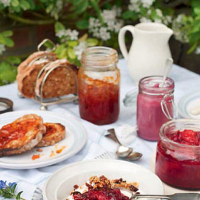 Once set, leave to cool slightly for 10 minutes before spooning into sterilised jam jars. Cover with waxed discs and lids while still warm. Store in a cool, dark place.